Another gray cold morning leaving Council. My plan was to avoid the highway and take the Weiser River trail most of the way to New Meadows. I rode a few miles on it yesterday and it was fine. I had to ride north and then off-route to Fruitvale to get back on the trail, but I didn't get very far when I decided it was too hard. It was a little muddy and a little rocky and I decided it would wear me out, so I went back to the highway. Of course then I had a big hill to climb which wore me out just as much. I was thinking it was a beautiful January day in the Rogue Valley, but of course I was in Idaho and it was the first day of summer. Some miles later, at the Evergreen Campground, I decided to try the trail again. I rode about 5 miles on it and enjoyed it pretty well. About a mile before it was supposed to end, the trail left it's natural course and took an abrupt turn uphill. I decided to turn back a quarter mile to a cross road I has just passed and got back on the highway. The Trucker was happy to feel pavement under it's tires again. Although it proved cabable off-road, I have to accept the fact that this bike is a true highway machine. We cruised the last few miles into New Meadows with ease. 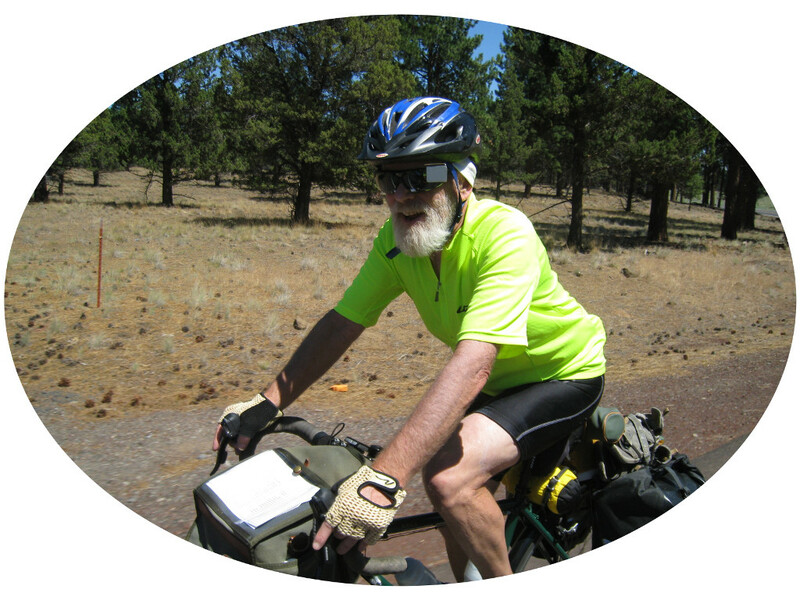 The Weiser River Trail actually goes for 85 miles. I first saw it in Cambridge yesterday. It parallels the TransAm for about 50 miles and could easily be used as an alternative by bikes with mountain bike tires. Most of the time it would also be fine for 1.5 inch tires. The mud I encountered is certainly unusual for this time of year. I assumed this was a rail-to-trail but when riding it I had some doubts. For one the bed was not very wide or high. It could only have been one track. Also all of the bridges were created new for the trail. There were no signs of any old railroad bridges. I will Google it when I have access and post a link here. Done. It is indeed a rail-to-trail. The narrative says the part I was on has the roughest surface. I stopped and had a hot chocolate at a place that had wi-fi and posted my last two blog entries, and then talked to Linda for a while. I wanted to do laundery but there was no laundermat in New Meadows. They said there was one in Riggins, 33 miles further on, so I decided to ride on. However I wanted to check out Zim's Hot Springs, 4 miles up the road, to see if I wanted to camp there. When I got going I was all set to cruise on to Riggins. The road was slightly downhill and I was rolling along at 18 mph. But when I got to the turnoff for Zim's the Trucker took the turn and here I am. Camp and soak for $12, with roofed over picnic tables (as it still might rain). They have a regular size swimming pool and a smaller hot pool. I have pitched my tent and a soak awaits me. Wow, that was great. The hot pool is 105 degrees, and the swimming pool almost as warm. I couldn't last as long as I wanted. After days and days of riding your body just goes limp when exposed to any kind of relaxation. I had to get out while I still had the energy to stand. I thought I would get cold when I got out, but the sun started peeking though and although it's still mostly cloudy it has warmed up quite a bit. So now I'm lying in my hammock warm and cozy thinking about what to make for dinner. Later on I'll walk back over to Zims and take advatage of his wi-fi to post this. Nice and green along the Weiser River. One of the many bridges on the trail. In the picture you see I have my rain covers over the rear panniers. I put these on as much for visibility as for rain protection. Cozy camp at Zim's hot sprigs. The shelter was probably more for sun protection but today it kept the rain off. The Little Salmon River. If you look carefully you can see some steam rising. This is what feeds the pools at Zim's hot springs.